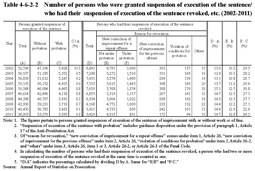 Table 4-6-2-2 shows the number of persons who were granted suspension of execution of the sentence with or without probation and the number of persons who had their suspension of execution of the sentence revoked by reason for revocation over the last 10 years. 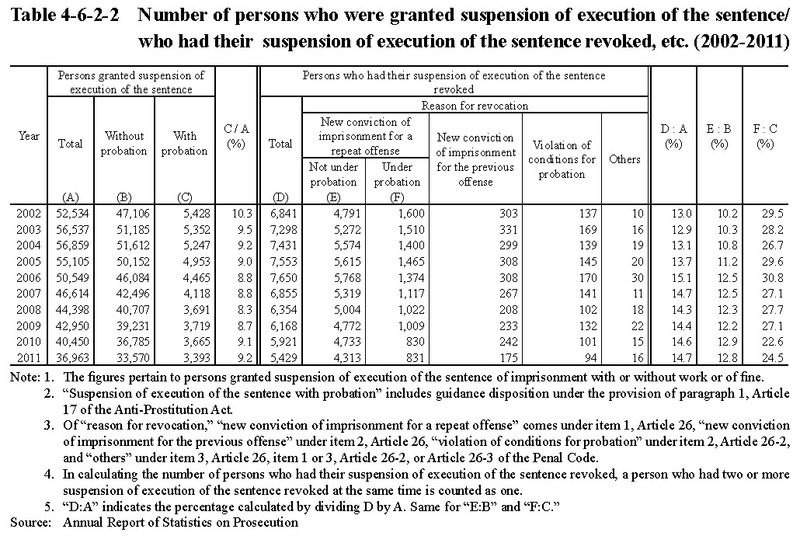 The number of persons who had their suspension of execution of the sentence revoked for new convictions of imprisonment without suspension of execution of the sentence for a repeat offense was increasing every year from 1993, but then turned to decrease in 2007, and was 5,144 in 2011 (94.8% of those who had their suspension of execution of the sentence revoked) (See the Appendix).The percentage of that number in 2011 to number of persons granted suspension of execution of the sentence in the same year was 13.9% (the persons who were granted suspension of execution of the sentence and those who had their suspension of execution of the sentence revoked involve two different groups, and hence the percentage of the latter to the former does not indicate the revocation rate. It is possible, however, to use the above information to observe a rough trend with the revocation of suspension of execution of the sentence that year).